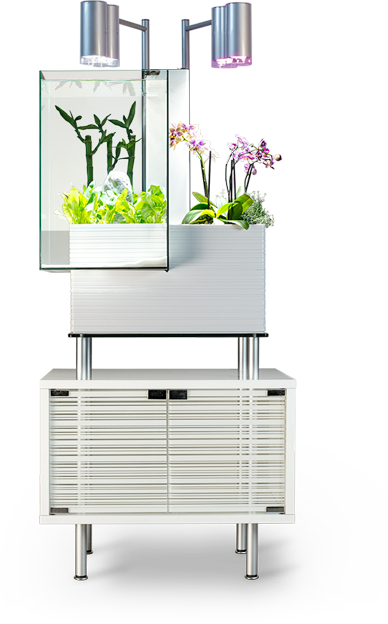 Introducing Brio 35, the first member of a new family of home aquariums that brings the science of aquaponics to your living environments in a truly elegant design. The Brio boasts an impressive list of features that makes for a unique experience of both having fresh water fish and growing herbs and plants. It has a lighting system providing highly specific color spectrums creating photosynthetic reactions, perfect for growing plants, herbs and flowers at surprising speeds. Available in lustrous black and white. Check out the Brio Cabinet on our accessories page, the perfect addition to the Brio urban eco garden.